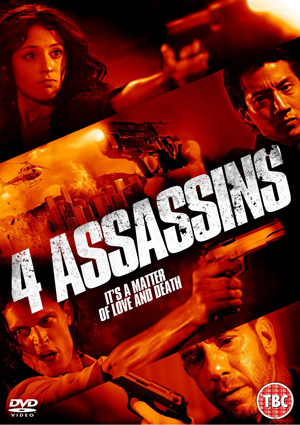 A rather stylishly shot action drama, 4 Assassins sees a quartet of killers meet in a swanky Hong Hotel room. They are there to discuss a hit that seemingly went wrong: two people were to be killed but only one body was found. The assassin in question is Marcus (Yun Lee) who swears there were two bodies and he terminated both targets. His partners in crime, however, do not believe him. There is old friend and mentor Eli (Ferrer) who despite caring a lot for Marcus knows he is lying and knows that Marcus is no longer a reliable killer. Then there is Cordelia (Renard), Marcus’ old flame and a ruthless killer herself and who also sees that Marcus has become weak. Rounding out the foursome is Chase (Williams) who is really only there to be annoying, British (so therefore, annoying!) and to provide tension within in the group as all he would really like to do is shoot Marcus in the head. So the four squabble, reminisce, have dinner and wait for the inevitable phone call signalling it is time to terminate Marcus. 4 Assassins might, unfortunately, be light on the action but it is still a satisfying little drama about killers contemplating their profession and coming to terms with the fact they have to kill one of their own. Despite the absence of copious action and the confined setting, the film never drags and tension is built quite nicely even if the climax if fairly predictable. The dialogue isn’t always quite as sharp and clever as the makers would like to think it is but the cast share genuine chemistry: especially Ferrer and Yun Lee who really feel like old friends and infuse their characters with actual personality. Now, the set up might not sound like the most appealing (a group of contract killers stuck in a hotel room chatting and having dinner) but, as mentioned, tension is built well and the film benefits from some striking photography. Frequent flashbacks are also included as the four discuss previous missions and we get to see them at work: these scenes also feature much of the, limited, action. There are a couple of nice hand-to-hand combat scenes including a somewhat brutal scene that sees Cordelia taking a beating on her first assignment, a silly sequence involving a car in Wales of all places (!!) and the requisite amount of silencer based gun action. It would have been nice to have a bit more action or at least another fight scene but 4 Assassins still works thanks to the likeable cast and stylish production design. It’s certainly a B-movie that is classier than you might first think and it’s always good to see the much-underrated Miguel (Robocop) Ferrer getting a nice meaty part.